What’s with the “nature names” below? At Shaver’s Creek, many of our staff members adopt a secondary “nature name.” These monikers are meant to be fun and are usually used during programs with kids, such as during Summer Camp and Outdoor School. Shaver’s Creek is part of Penn State Outreach, but we have teaching agreements with many colleges and departments across Penn State. Some staff members also serve as faculty for recreation, park, and tourism management in the College of Health and Human Development or the School of Forest Resources in the College of Agricultural Sciences. Lexi Arnold is ecstatic to spend the summer teaching about the wonders of the outdoors following her SEED semester with Shaver’s Creek. She is currently a junior studying recreation, park, and tourism management with a focus in outdoor recreation and a minor in sustainability leadership. Lexi loves exploring new places, hiking, cooking, hanging out with friends, and planning her next adventure. Her favorite place in the world is the rocky, Redwood-lined coastline of California on a cool, foggy morning. A quote she aims to live by is this: “Walk as if you are kissing the earth with your feet.” (Thich Nhat Hanh). Graham is a Penn State alumni from the class of 2017 who majored in animal science with a minor in wildlife and fisheries science. Graham has done internships at two different zoos and field work for Mississippi State and the PA Game Commission. He chose to intern at Shaver’s Creek to incorporate his animal knowledge and experience into environmental education. Here, he hopes to improve his skills as a educator and wants to become an education keeper at a zoo. Rory graduated from Penn State in May 2018 with a degree in communications, arts, and sciences and a minor in human development and family studies. She has traveled all over the world — North America, Europe, South East Asia, and Africa — and has always enjoyed experiencing the diversity of the natural world and the cultures within it. Her nature name, Koh, comes from her travels in Thailand. She is excited for the opportunity to grow as an environmental interpreter and leader. Gary Palmer completed a BS degree in biology at Saginaw Valley State University and an MS in post-secondary biology education from Northern Michigan University. In recent years he has studied migrating birds as the hawk counter and waterbird counter at Whitefish Point Bird Observatory in Michigan and spent his summers conducting surveys for the Illinois Natural History Survey. He has always been a nature lover and discovered the world of birding when he took courses in ornithology at NMU. In addition to being an avid birder, Gary also enjoys photography, reading, traveling, camping, and hiking, and takes every opportunity he can get to go curling. Olivia Stas is thrilled to be at Shaver’s Creek this fall! She completed a bachelor’s degree in kinesiology with a minor in psychology at Penn State in the summer of 2018 and was involved in a variety of of programs at Shaver’s Creek throughout her undergraduate career. She participated in the AURORA program as a Vega participant, Maple Harvest Festival as a volunteer, and Outdoor School as a counselor and learning-group leader. Olivia spends as much of her free time in the outdoors as possible, whether it be participating in a new outdoor adventure activity or going for a hike in a familiar place. She looks forward to working with the incredible Shaver’s Creek staff and spreading her love for nature with visitors and the surrounding community. Alex Webb is excited to join the Shaver’s Creek staff. She graduated in May from Juniata College with a degree in environmental studies. 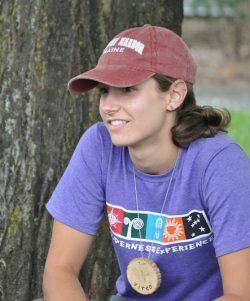 Alex previously worked as an environmental education intern for the Maria Mitchell Association, and for Camp Blue Diamond. She can’t wait to work outside and learn about everything there is to offer at Shaver’s Creek. Matt is a current Penn State Student studying Recreation, Park, Tourism Management, and graduating in May 2019. He discovered Shaver’s Creek through one of their programs, Outdoor School, and has since found a great appreciation for the outdoors. He hopes to become a better educator, birder, leader, pun-deliverer, and person during his time at Shaver’s Creek. 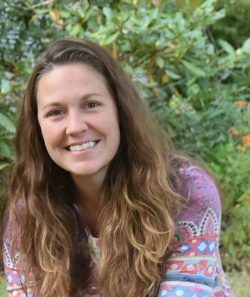 Bridget graduated from the SUNY College of Environmental Science and Forestry with a degree in environmental education & interpretation in 2017. 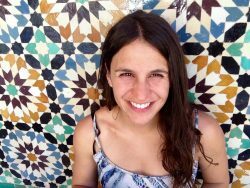 She has spent the past few years working various positions in the outdoor field, allowing her to travel and live in places like Aspen, Colorado, the Adirondack Mountains in New York, and northern Spain! When not working outside, she enjoys spending her free time outside, rock climbing, hiking, or riding her bike. 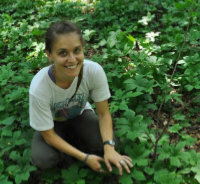 Carli is a graduate student in the Department of Ecosystem Science and Management at Penn State and is working on her master’s degree in ecology in Dr. David Miller’s Applied Population Ecology Lab. Carli earned an associate’s degree in wildlife technology and a bachelor’s degree in wildlife and fisheries science from Penn State. 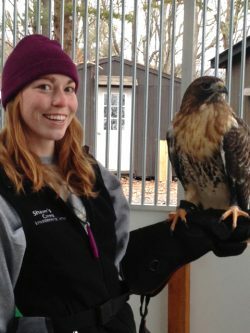 As a work-study student in Shaver’s Creek’s Raptor Center, she assisted with animal care and led Traveling Naturalists programs for public audiences. 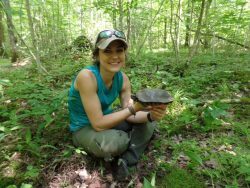 Carli’s research includes using statistical models to examine variation in growth rate with respect to life-history and environmental factors in populations of Western terrestrial garter snakes and studying the thermal ecology of wood turtles in the Stone Valley forests around Shaver’s Creek. Teal comes to the diverse forests of Pennsylvania (“Penn’s woods”) from the front range of Colorado where she worked in the herbal medicine world, manufacturing tinctures and growing herbs for skincare. She is a Georgia native who studied environmental science and organic agriculture at the University of Georgia. She learned medicinal and folk uses of southeastern plants at the BotanoLogos School of Herbal Studies in the north Georgia mountains where she became passionate about the wonders of botanizing in the forest and making plant-based medicine. Her research interests range from ethnobotanical uses and chemistry to the cultivation and sustainable management of medicinal forest plants. 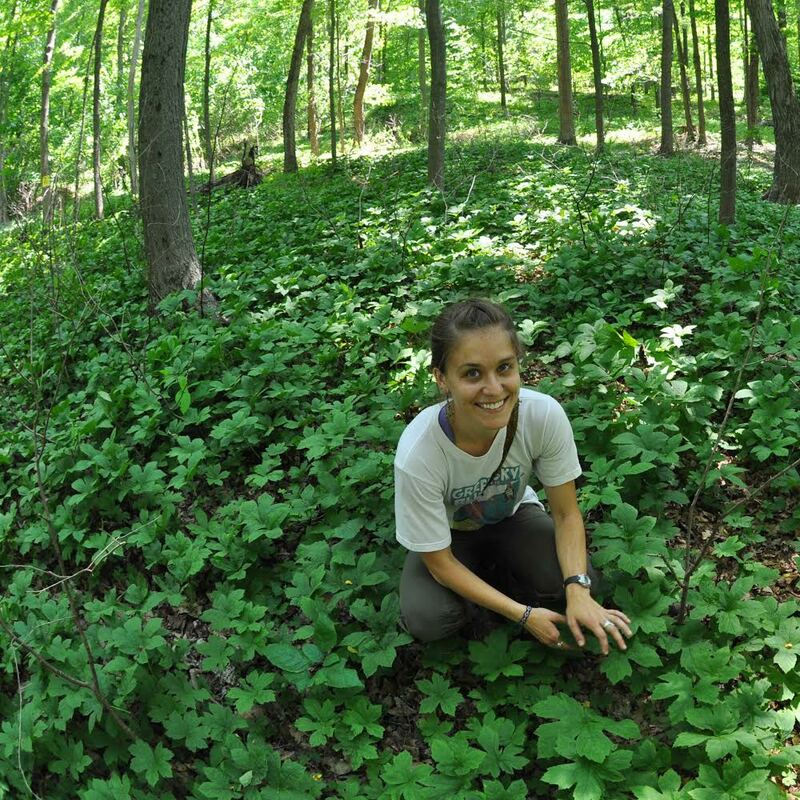 She is working towards a master’s degree in forest resources at Penn State. Tim is an M.S. candidate in the recreation, park, and tourism management program. His research interests center around what it means to engage young people in meaningful educational experiences in the outdoors and examining what inspires individuals to become lifelong stewards of the natural world. Prior to attending Penn State, Tim earned a B.S. in biology from SUNY Geneseo in upstate New York. He worked as an ecological research technician at the University of Minnesota and Cornell University, post-graduation. During this time, he found himself contemplating what it means to inspire a universal land ethic in future generations and engage broader audiences in work like he was doing. This interest brought him to Conserve School, an environmental boarding school in northern Wisconsin, where he worked as a teaching fellow for two years. He will be building upon these experiences by putting his teaching and research energies towards Outdoor School at Shaver’s Creek under the guidance of Ellen Will. In his free time, Tim is an avid runner, paddler, and backpacker. When not adventuring, drinking good coffee and reading are some favorite pastimes! Maria Jose is a Ph.D. candidate for the recreation, parks, and tourism management program at Penn State. She comes from Chile. She holds a bachelor’s degree in organizational psychology from Pontificia Universidad Catolica de Chile and a master’s degree in consultation and intervention in sports, physical activity and health, from the University of Ottawa in Canada. Her research interests relate to what it means to be human and to lead a meaningful life, how time in the wilderness and experiential learning can help people become global citizens and promote the United Nation’s sustainable development goals. Maria Jose is passionate about traveling and CrossFit. Meg has loved animals and nature her entire life and is always excited to educate others on different animal species. From living in the Southeast and getting her bachelor’s degree in animal science at Clemson University, she has moved up the east coast to get her master’s degree in curriculum and instruction at Penn State and is looking forward to learning how to survive her first real winter. Her research interests are focused on how multimedia technology changes the way students learn about endangered species. In her free time, Meg loves going on hikes to add to her ever-growing collection of nature photographs, and she loves to travel and SCUBA dive. Being so passionate about endangered and threatened species, her favorite trip abroad has taken her to see One-horned Rhino and Bengal Tigers in their natural habitats. Pete is the director of the Kurt Hahn Consortium for Values and Experiential Learning and is jointly appointed between Shaver’s Creek and the Department for Recreation, Park and Tourism Management (RPTM). Originally from the United Kingdom, Pete is committed to experiential learning and values education. His current work is with the Professional Ski Instructors of America and the American Association of Snowboard Instructors (PSIA-AASI). Pete also works closely with Outward Bound and the Duke of Edinburgh International Award. Pete is a passionate skier, canoeist, and mountaineer, and also has a crossfit addiction. Jennifer helps to manage animal care, interpretive animal programs, interns, volunteers, work-study students, and the Honorary Animal Caretaker Program. She is an instructor for Environmental Education Methods and Materials (RPTM 430). 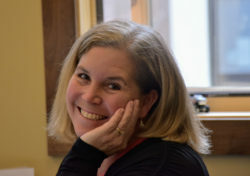 In 1996, she earned her bachelor’s degree in biology and environmental science from Westminster College and a master’s degree in environment and community from Antioch University Seattle in 2001. Jennifer is originally from Port Allegany, in north central Pennsylvania. She and her sons, Isaac and Henry, husband, Doug, and their dogs, Tioga, Penny, and Winston, now make their home in Pine Grove Mills. Her interests include exploring, crocheting, making jewelry, and spending time with friends and family. Jason oversees the care, training, and presentation of Shaver’s Creek’s live animal ambassadors, a menagerie of amphibians, reptiles, and non-releasable raptors. He and a team of staff, interns, and volunteers provide the daily care, training, educational interpretation, and conservation outreach programming with the animals. 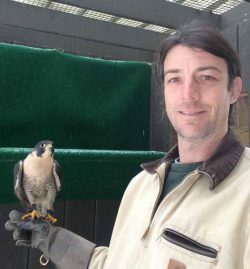 In addition to training animals, Jason is a certified professional bird trainer (CBPT-KA) and trains students and interns daily at the center and through Avian Education Outreach Techniques (WFS 497) and other University classes. Jason also serves on the Education Committee for the International Association of Avian Trainers and Educators. A Penn State graduate, he began his career at Shaver’s Creek as a volunteer and later served as an intern. 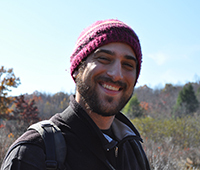 Prior to returning to Shaver’s Creek in the fall of 2014, Jason worked for Delaware Nature Society, Aullwood Audubon Center & Farm, Audubon Pennsylvania, and Wildwood Park. A lifelong naturalist, he lives in a village at the base of Pine Grove mountain with his wife Magritte, children, Sasha and Cooper, and their feline family members, Catkin and Samara. 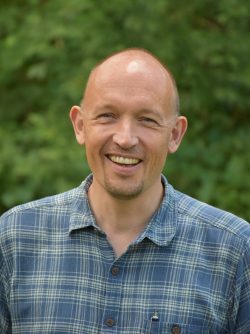 Dr. Eric Burkhart is a botanist who specializes in ethnobotany, non-timber forest products, and agroforestry in his teaching, research, and educational outreach endeavors. He holds degrees in economic botany (B.A., Idaho State University), horticulture (M.S., Penn State), and forest resources (Ph.D., Penn State) and is currently plant science program director for Shaver’s Creek Environmental Center and faculty instructor for the Penn State Ecosystem Science and Management Department. 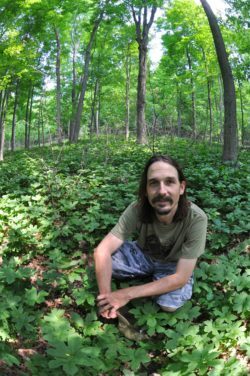 His research program in Pennsylvania is focused on developing sustainable wild crop management and production systems for American ginseng (Panax quinquefolius), goldenseal (Hydrastis canadensis), ramps (Allium tricoccum), and other native forest plants through the use of agroforestry cultivation and plant husbandry. Kayla is one of the assistant directors for Summer Camp and coordinates our summer camp high school volunteer Leader-In-Training program. 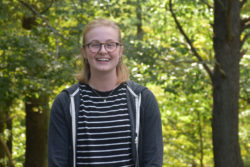 Acorn, as she is better known at Shaver’s Creek, is pursuing her degree in early childhood education at Penn State with minors in special education, human development and family studies, and French. 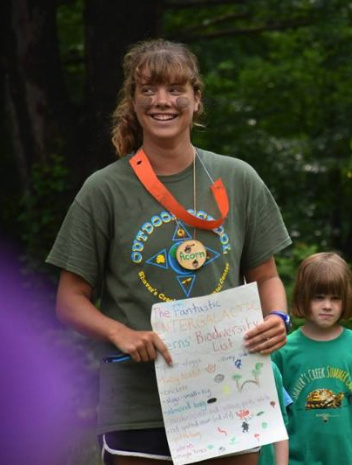 Acorn loves exploring the natural world, and her favorite part about camp is seeing kids of all ages connecting with the earth and becoming compassionate leaders and stewards of the environment. In the rare moments when she’s not at camp, planning for camp, or talking to someone about her favorite camp memories, you can probably find Acorn reading a book, practicing her photography skills, or spending time with her family and friends. Shaver’s Creek is her favorite place and her second home, and she feels lucky to witness so much discovery here! Jen directs the AURORA Outdoor Orientation Programs for incoming students to Penn State. 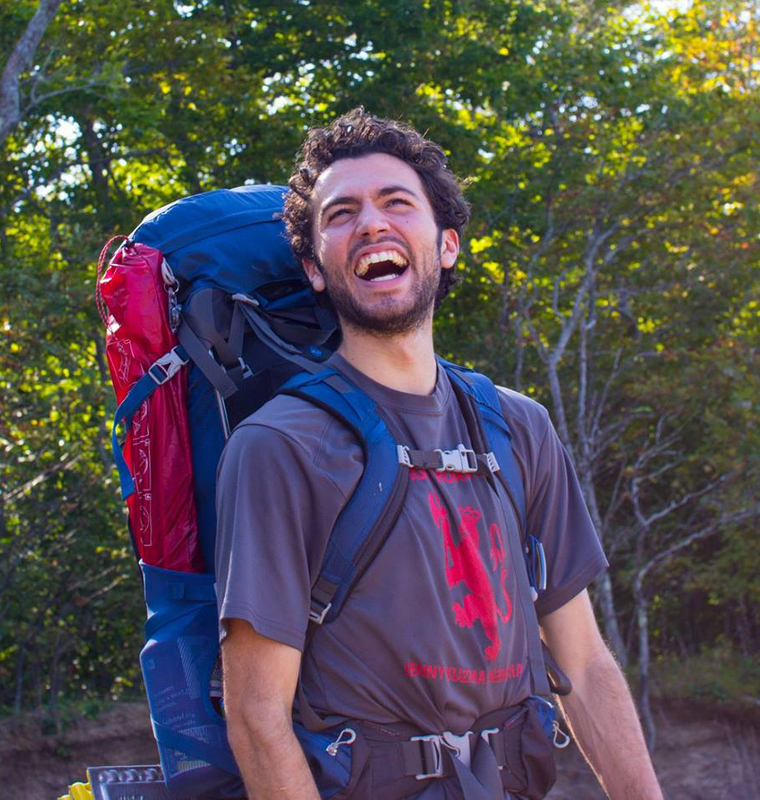 These for-credit programs are multi-day backpacking expeditions in central Pennsylvania, Washington, New Hampshire, and Vermont, or a community service trip to inner-city Philadelphia. All expeditions are geared toward aiding incoming students to Penn State with their transition from high school to college. Students learn about college life, set goals for their first semester, and make lasting friendships. 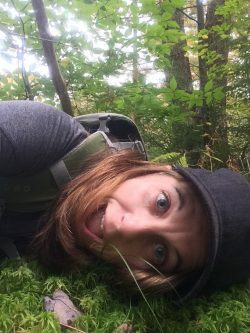 She is also an instructor for Penn State courses such as Adventure-based Programming Leadership, Leadership Development Techniques and Training Tactics for Outdoor Leaders, and Backpacking Leadership. Jen was originally an intern at Shaver’s Creek in the summer of 2000 and an assistant program director for Outdoor School from 2003–2005. She returned to Shaver’s Creek in 2010 (after living and working in New England for five years) to what she sees as her dream job — helping develop leaders through wilderness education. Jen earned her bachelor’s degree in recreation and park management from Penn State in 2001 and a master’s degree in environmental studies from Antioch University of New England in 2007. She enjoys spending time pursuing outdoor adventures with her son. She also likes to ski, rock-climb, and find new places to hike. Abby assists with the supervision and training of a team of Penn State students, interns, and community volunteers that work to care for, train, and educate diverse audiences with Shaver’s Creek’s animal ambassadors. She provides conservation and educational programs and development of education resources. Abby grew up in the flatlands of eastern South Dakota, where she obtained her bachelor’s degree in biology and secondary education at South Dakota State University, with a minor in psychology. Before settling into the mountains and forests of central Pennsylvania, Abby developed her raptor training and education skills at the American Bald Eagle Foundation in southeastern Alaska, led summer camps at SeaWorld in Texas, and studied the New College of Florida’s coastal marine lab. A teacher at heart, Abby also instructs online English as a Second Language (EDL) classes to children in Beijing. After spending each day with her feathered, scaly, and bipedal coworkers, she enjoys coming home to her feathered family member (a parakeet named Bee), oil painting, reading, hiking, ice skating, and jigsaw puzzling. Siara grew up in Petersburg, PA and is currently residing there. Even though she lives so close to Shaver’s Creek, she is fairly new, taking her position here in spring 2018. She is excited to be here and learn more about what Shaver’s Creek does. Siara graduated from Penn College in 2017 with an associate degree in business management. Her duties at Shaver’s Creek include bookstore operations and visitor center services. In her free time, she enjoys hiking with her dog, going to the dog park, kayaking, making stuff out of paracord, and playing fetch with her “foster-failure” kitten. Jon promotes conservation through citizen projects such as Project Nestwatch, Monarch Watch, Winter Raptor Surveys, and seasonal hawk watches. In the spring, Jon partners with the State College Bird Club to help coordinate the Tussey Mountain Hawk Watch, a major flyway for Golden Eagles. While majoring in wildlife and fisheries science at Penn State, he became aware of the great volunteer opportunities Shaver’s Creek has to offer. Since then, he has been a work-study student and raptor center intern, and has assisted with public programs at Shaver’s Creek. He has served as a hawkwatcher for nearby Tussey Mountain and has also traveled and worked with other organizations such as Cape May Bird Observatory and Intermountain Bird Observatory in Idaho. 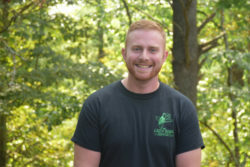 Jon has a passion for canoeing the Juniata River, native plants, exploring new habitats, and connecting people to the avian world. 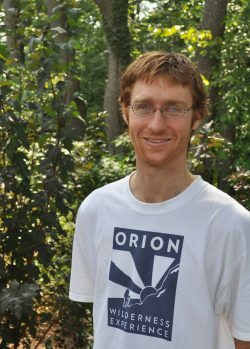 Drew assists with all the AURORA Outdoor Orientation Programs and has been a part of the team since 2012. 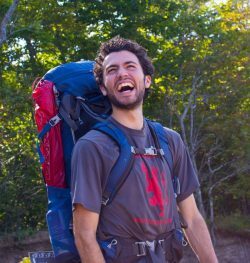 He works to develop leaders through outdoor recreation and help those leaders work with incoming Penn State freshmen to ease their transition to college life. He has also worked with the Outdoor School program at Shaver’s Creek and has assisted with field components of the Adventure-Based Programming Leadership classes (RPTM 330). He graduated from Penn State in 2012 with a bachelor’s degree in human geography. He has a passion for teaching and all things outdoors, and hopes to continue to use outdoor recreation as a means of educating people and developing leaders. He has also worked as a guide with Penn State Adventure Recreation and as an instructor at Tussey Mountain. His interests include snowboarding, biking, skiing, paddling, backpacking, climbing, crocheting, sailing, cooking, skipping rocks, soccer, and spending time with friends and family. Matt has been helping to direct Outdoor School, Discovery Camp, and Kids Corner. 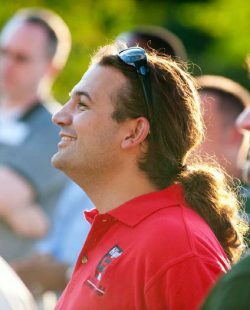 He graduated in 2006 from Penn State with a bachelor’s degree in environmental interpretation and in 2016 from Slippery Rock University with an M.S. in park and resource management. He likes all things outdoors and enjoys living in Alexandria, PA.
At Shaver’s Creek, Lucy oversees the K–12 curriculum-based school outreach programming and coordinates the graduate assistant program. She is an instructor for RPTM 430 (Environmental Education Methods & Materials), SCIED 455 (Field Natural History for Teachers), and SUST 200 (Foundations of Sustainability & Leadership). Lucy is also involved with several grant-funded research projects with Penn State’s College of Education; her research interests include family science learning processes in the outdoors and mobile-based learning designs for outdoor spaces. She enjoys spending time getting a toddler’s perspective of their backyard with her son, Conary, and husband, Casey. With a dog, Scout, and two cats, Koko and Neko, it is a busy house! Lucy is also an avid sports fan and jumps at the chance to knock around a soccer ball. At Shaver’s Creek, Laurie is an instructor in the RPTM department, teaching Teambuilding Facilitation (RPTM 230), Interpreting Maple Sugaring to Families (RPTM 297), and the First Year Seminar (RPTM 297) for AURORA students. In addition to teaching, Laurie coordinates the SEED Semester (a 17-credit block of outdoor and environmental education courses taught at Shaver’s Creek each spring) and directs our Maple Harvest Festival. Laurie has been affiliated with Shaver’s Creek since 1993, and served as a past director of the team building program. She received a bachelor’s degree in recreation and park management — environmental interpretation from Penn State in 1988 and a master’s degree in experiential education from the University of Colorado in 1992. Laurie and her husband Mark have two boys, Brian and Sean, with whom they love spending time in the outdoors. Her interests include hiking, birdwatching, paddling her canoe on local lakes, reading, baking pies, and traveling to cool places. Laurie is also an avid sports fan, with much of her energy going toward supporting the Chicago Cubs. Mark teaches First Aid and Safety courses and the Discovery Trip class and is a member of multiple Penn State Outreach committees. He is responsible for cultivating the resources necessary to make Shaver’s Creek successful. Mark received a bachelor’s degree in wildlife biology, with a minor in forestry, from the University of Vermont in 1985 and a master’s degree in environmental education from Montclair State University in 1988. Mark likes birding, baseball, fishing, reading, and spending lots of time with his family — Laurie, Brian, and Sean. John assists with the AURORA Outdoor Orientation Programs in a multitude of ways, including the coordination of AURORA’s marketing and communications. He earned a bachelor’s degree in English from Penn State and is happy to return to his alma mater. He also earned an M.F.A. 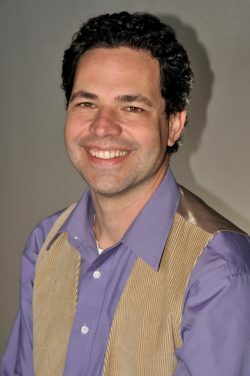 in creative writing from the University of North Carolina, Wilmington, where he studied under the New York Times bestselling author David Gessner — in a fun bit of interconnectedness, Gessner came to Shaver’s Creek in 2012 to serve the Long-term Ecological Reflections Project (LTERP). During his time in North Carolina, John interned with Lookout Books, an independent literary publisher, and served as lead designer for Ecotone, an award-winning, environmentally concerned literary magazine. John’s greatest passion is to read, specifically works that engage nature. He also likes to hike, be near water, and seek out solitude. Tesha is the program director for all things Summer Camp related. She also coordinates the Fall Harvest Festival, featuring the Children’s Halloween Trail. Tesha earned her bachelor’s degree in recreation, park, and tourism management from Penn State in 2005. 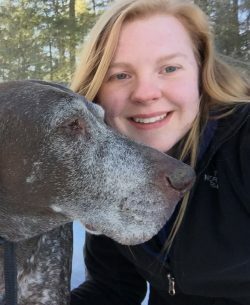 She was a part of the Shaver’s Creek community from 2001–2005 in a variety of ways, including work study student, intern, Outdoor School counselor then Learning Group leader, Birding Cup participant, and Summer Camp counselor. After leaving Shaver’s Creek upon graduation, Tesha taught seasonally in 7 different states from the coastal barrier islands in Georgia to the canyons of Alabama and up into the forests of Connecticut. She then served two years as a district executive for the Boy Scouts of America in the Philadelphia area. When Tesha is not preparing for Summer Camp or the Fall Harvest Festival, she enjoys sewing by hand, learning more about all aspects of medicinal plants, and exploring new places with her trail buddy, TacoCat. She is excited to be back at Shaver’s Creek and is looking forward to once again being immersed in the world of outdoor education! Chris is the program director for the Team Development Center at Shaver’s Creek and teaches Team-building Facilitation (RPTM 230). He started his career in the early 90s at Shaver’s Creek as a Penn State undergraduate student earning a degree in recreation and park management. After almost 20 years exploring the Northeast, Chris is excited to be back where it all started. For the past 10 years, while working for High 5 Adventure in Brattleboro, Vermont, Chris has delivered challenge course trainings and team development programs for schools, university groups, corporations, and professional sports teams that strengthen relationships, motivate growth, and develop leaders. Chris co-authored the Second Edition of The High 5 Guide: Challenge Course Operating Procedures for the Thinking Practitioner as well as the Ubuntu Activity Guide. He holds leadership roles in both the Association for Experiential Education (AEE) and the Association for Challenge Course Technology (ACCT). Chris and his wife Kristin have two wonderful daughters, Julia and Indy, and a dog, Pelé. When Chris isn’t enjoying time at home with his family, you will likely find him exploring the local mountain bike trails, playing disc golf, or knocking a puck around the hockey rink. Oh, and he loves chocolate. Joshua works to keep Shaver’s Creek a vibrant educational facility that directly supports the Center’s wide range of credit, non-credit, outreach, and research programming. Joshua is responsible for managing strategic communications to support Shaver’s Creek programs and for developing interpretive materials throughout the facility to support the Center’s educational mission. He also manages our bookstore and membership program. 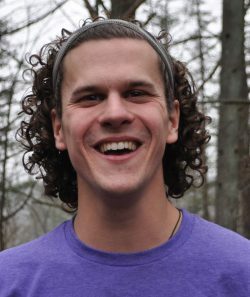 Joshua received a bachelor’s degree in integrative arts from Penn State, focusing on multimedia and environmental education. 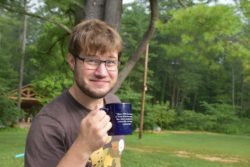 After seven years working as a naturalist and outreach coordinator for Tin Mountain Conservation Center in Conway, New Hampshire, Joshua returned to his native Pennsylvania to join Shaver’s Creek in 2010. He grew up just over the mountain in Pine Grove Mills and has a long association with Shaver’s Creek — as a summer camper from ages 5 to 18, as a volunteer in high school, as a student and teaching assistant while at Penn State, and now as staff! Joshua also enjoys birding, hiking, and spending time outdoors with his wife Sarah, son, Ellory, and daughter, Lucy. 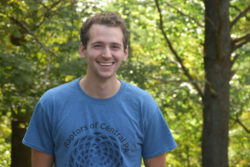 Justin came to Shaver’s Creek in 2010 as a SEED Semester student, returned as an Environmental Education intern the following summer, and started his current role in January 2015. His degree is in recreation, parks and tourism management. He is interested in how technology can help connect people to the outdoors (and each other). Justin works on a variety of interpretive and marketing materials for Shaver’s Creek, including videos, newsletters, digital graphics, signage, podcasts, photography, and Shaver’s Creek’s presence on the web and social media, like the Photo-a-Day feature. He gets to make stuff every day that encourages people to explore their own backyards! Justin enjoys hiking, Geocaching, homebrewing, tossing pizzas, video games, and board games. Alexa develops and coordinates the programs that enhance and engage school children’s learning at Shaver’s Creek. She grew up in Arizona and earned her bachelor’s degree in biology at Pomona College in Southern California, before moving east and discovering the forest. She has returned to Shaver’s Creek several times since 2014, working as an intern and with summer camp programming. 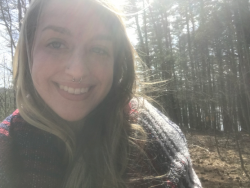 Between her stints at Shaver’s Creek, Alexa led adventure trips for youth in New Hampshire, worked for a study abroad organization in Panama, and taught environmental science at Conserve School in Wisconsin. Alexa loves exploring Central Pennsylvania and beyond, birding, watercoloring, being active outdoors, and learning new skills, like playing the guitar! Brian is responsible for maintaining the facilities and grounds at Shaver’s Creek and coordinating volunteer groups and work-study students. Brian also assists with a wide variety of programming — from school and youth programs to team building and bird of prey shows. Brian graduated from Penn State in December 2001 with a bachelor’s degree in recreation and park management. For twenty-five years he has been involved in Scouting — becoming a Tiger Cub at age 5, working on staff at Camp Mountain Run, sitting on the Bucktail Council Camping Committee, and being an adviser of Venture Crew 509. His twelve years of summer camp experience includes archery range instructor, director of camp program, and director of the first-year-camper program, before being appointed camp director in 2005. Brian has an uncanny knack for pop culture and historical trivia and enjoys model rocketry, paintball, and hockey. 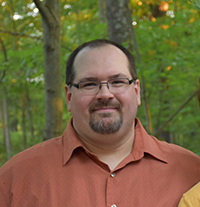 Brian, his wife Johanna, and son, Logan, enjoy cooking, camping, and hiking whenever possible. Marie supports the management of the Shaver’s Creek bookstore/gift shop operation, our membership program, and the promotion of our many events and programs throughout the year. 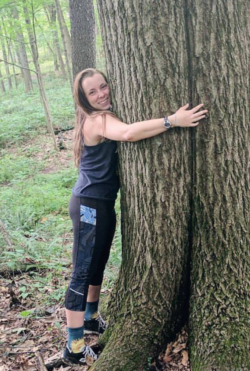 A State College native, Marie recently returned to the area after living in Pittsburgh, and is delightfully reconnecting with nature in the Shaver’s Creek woods. She enjoys hiking, swimming, and spending time with her family. Caitlin is part of the Outdoor School on-site director team and helps with all aspects of the program. Previously Caitlin was a Shaver’s Creek intern and Summer Camp naturalist. 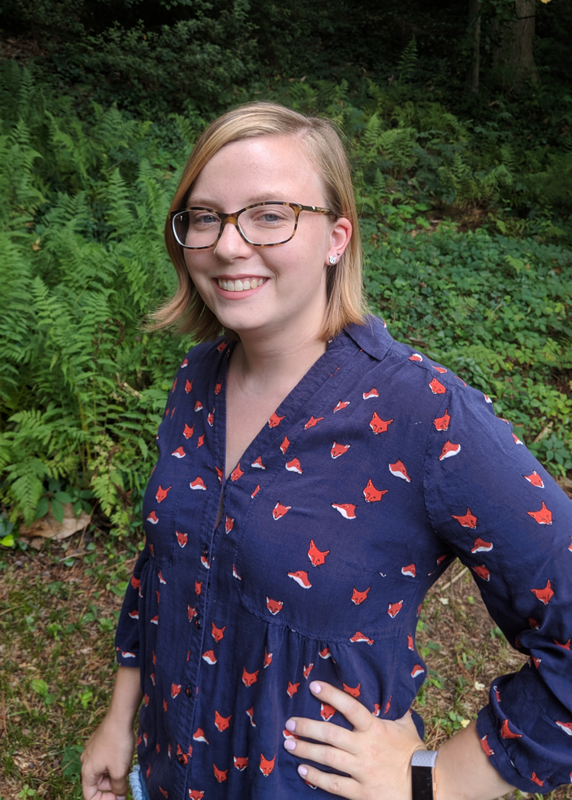 She graduated from Penn State in 2017 with a degree in Earth science and policy (option: water and land use) and a minor in geoscience. 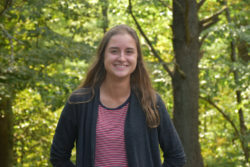 When Outdoor School is in the off-season, Caitlin works with the Spring Creek Watershed Commission and is a director for a nature-themed Penn State Science-U summer camp. When she’s not working, Caitlin enjoys being outside, playing video games, and hanging out with her cat, Perry. Doug coordinates the environmental education internship and birding programs and serves as instructor of Principles of Environmental Interpretation (RPTM 325), Interpreting Halloween to Children (a cleverly disguised biodiversity festival, RPTM 297B) and Natural History Interpretation (RPTM 326). Doug received his bachelor’s degree in wildlife ecology from Penn State in 1989 and has served four years in the U.S. Army Medical Corps. He is sanctioned by The National Association for Interpretation as a trainer of Certified Interpretive Guides, and since 2005, Doug has co-led Audubon’s Coastal Maine Bird Studies for Teens week on Hog Island, Maine. He is married to Susan and they have two sons, Dylan and Duncan. His ongoing interest is fostering the awareness of the diversity of life in our own backyards. Ellen manages the residential Outdoor School program, teaches its companion courses, and assists with the internship program. 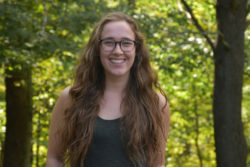 She believes that camp can change lives and enjoys seeing the interrelationships between the Penn State student leaders and the elementary-aged participants at Outdoor School. 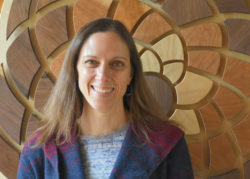 Ellen earned her bachelor’s degree in interdisciplinary studies — environmental education from Appalachian State University in 1995, and her master’s degree in environmental education at Slippery Rock University. Her thesis topic was a study of the long-term impact of the Shaver’s Creek internship program (which, by the way, 97% of former interns report was a positive experience and would recommend to a friend). 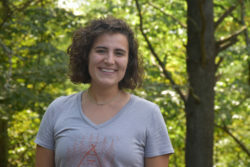 Ellen is a member of the American Camp Association and serves on the PSU Youth Programs Council. Ellen lives in State College with her husband Thad, and their two sons, Jacob and Nate. 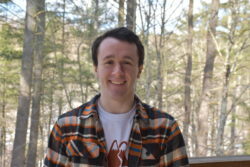 Will co-directs the Shaver’s Creek Team Development Center and Rock n’ River Adventure Camps. Will is also the director of facilitator development for World in Conversation at Penn State’s University Park campus, where he teaches people how to talk about taboo subjects such as race, gender, and long-term conflicts. With more than two decades of experience facilitating team development and group dynamics, Will has earned a reputation as a first-rate instructor. Working with groups ranging from corporate entities to adjudicated youth, school students to senior programs, Will has helped thousands of people to foster positive communication and self-actualization. He especially loves empowering participants with social skills that can be applied both to within-the-group training and to everyday life. He is certified by the American Canoe Association to teach canoeing and kayaking, and he loves using the outdoors to encourage people to know themselves. 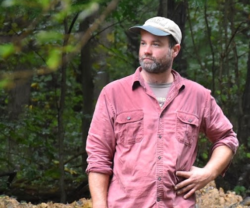 He has a degree in forest management from Michigan Technological University, a master’s degree in workforce education from Penn State, and spent five years as the director of Nature’s Classroom, a nontraditional school in New England. Join our “Letters from the Birdbox” newsletter!